Yewno’s visual approach to scholarly searching is gaining acceptance in major libraries. During a panel discussion at the American Library Association’s 2017 Midwinter Meeting in Atlanta, Michael Keller (Stanford University Libraries), Chris Bourg (MIT Libraries), and Cheryl McGrath (Stonehill College’s MacPháidín Library) gave a fairly unanimous account of the state of scholarly search (see Figure 1). While the current crop of discovery platforms gives users access to data, they were looking for something that was even more intuitive, and they had been evaluating Yewno as that fresh approach that might add a new level of excitement to discovery. 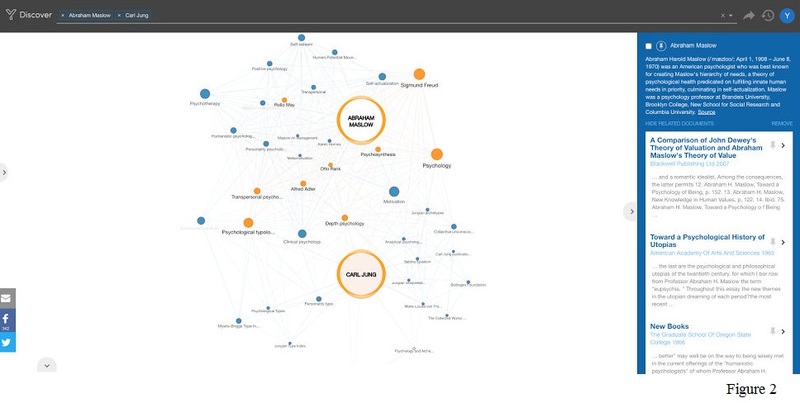 Rather than offering text-only access, Yewno produces images showing nodes of information on a given topic and displays the interconnections between the main search term and other concepts in its universe. The search path for getting information from Yewno ensures that false drops are avoided. When the term “East of Eden” is searched, the user will be shown a screen of possible terms and may choose to activate information about the John Steinbeck novel and eliminate references to British politician Anthony Eden, who worked on Middle Eastern issues. In the case of this example (see Figure 2), the search term “Jung” retrieved a number of possible references, but the one for psychologist Carl Jung was chosen, and other similar names were eliminated. The results image shows that Abraham Maslow and Jung were both heavily influenced by Sigmund Freud. The accompanying textual information gives the researcher a quick look at the details of any node and provides links to access-specific writings that cover those subjects. With hundreds of interconnections showing, Yewno eliminates the problem found in most text-based search devices: that only a small portion of relevant hits appear in the initial screen. A column at the right of the results map shows informational paragraphs about the two main topics, and then the user is given a selection of links to articles that are the most relevant for all terms. If the user’s library subscribes to the database providing the link, they can access the article immediately. Otherwise, they will have access to an abstract and could, presumably, get the full text from their library’s interlibrary loan service. If the user clicks on one of the lines on the map to highlight a direct connection between two concepts, the information in the last column will display articles or ebooks that cover both items. While the end result for searching in Yewno and standard discovery platforms is a relevant text article, Yewno strives to add an extra dimension. Ironically, while Yewno works on precise retrieval of terms, it advances the claim that this type of searching will lead researchers to useful concepts they didn’t know they were trying to find. That would make it a discovery platform in the truest sense of the term. Yewno is relatively a toddler in the IT world. It was born in 2014, although the initial research began in 2009 at King’s College London. Founder Ruggero Gramatica had developed a new kind of search platform, and this got the attention of Stanford University’s vice provost and university librarian, Michael Keller, who helped introduce this technology into the wider world of education. Yewno staffers do not talk about previous startups that evolved at Stanford—it is not necessary. Each new database, when added to the index, makes for a more populated and robust display for researchers. Since the visual display is limited to 25 subconcepts, Yewno added a sliding bar at the bottom of the screen. Starting with the most likely matches, the bar allows the user to see other groups of 25 concepts matching the same terms. In 2016, Silvio Scaglia, a strategic investor, was so taken by Yewno’s new approach to research that he funded the company with a $10 million check. Scaglia said that he was very impressed with Yewno’s operation and was lucky to be a part of it. In November of that year, Desmond Shum of GO VR, LLC added another $6.5 million. This influx allowed the company to expand beyond its Silicon Valley location and open offices in New York and London. Starting with Stanford, Yewno began to show up in major research libraries in the U.S. and around the world. Harvard University, the Massachusetts Institute of Technology, the University of Notre Dame, New York University (NYU), the University of California–Berkeley, the University of Michigan, the University of Oxford, and the Bavarian State Library are all associated with Yewno. Most are describing their involvement as beta testing. At the panel discussion in Atlanta mentioned earlier, nobody reported any formal study of how Yewno is perceived by students or faculty members, but they did report enthusiasm on the part of their users who had tried the new service. Unfortunately, the Yewno options at these universities are locked down, so the independent researcher does not, at the moment, have a chance to try out the service firsthand. However, trials are available to libraries that want to look for themselves. Yewno’s literature claims that the setup procedure is relatively simple—it just needs IP ranges and details about the off-site options from each library. According to several sources at Yewno, 2017 looks to be a major year of expansion for the young company. It is exploring the addition of original content from universities, including maps, archives, and special collections. Chabak says a special Yewno for medical libraries will be put into development, and a similar product for law libraries is being investigated. The company is adding new language options for the product, beginning with German, and a Chinese Yewno is in the works. Also, an online presentation by Vicky Hampshire reports that the company will be adding a mobile product this year as well as more analysis of video and image data. Given the exponential growth of this enterprise, Yewno should soon be a major power in the world of research technology. Figure 1 courtesy of Terry Ballard; Figure 2 courtesy of Yewno.